We start off with our wrapping story (Directed by Wingard) where we have a group of guys performing random acts of violence and destruction. After they finish destroying some homes, one of them talks about making some money by breaking into a house to steal a videotape. Upon breaking into the house the group discovers tons of tapes and a dead man sitting in a room full of televisions. As the team splits up to explore the house further, unsure of which tape they are there for, members of the group start sitting down in the room to watch the tapes. The first tape (Directed by Bruckner) is the story of a trio of guys equipped with a set of hidden camera glasses who manage to bring home the wrong girl. 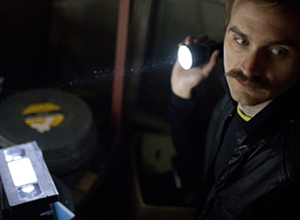 The second tape (Directed by Ti West) appears to be as simple vacation tape from a young couple, but things start to go awry after the appearance of an unknown visitor. Tape 3 (Glenn McQuaid) brings us the familiar horror set-up of a group of horny kids headed to the lake, until one tells the others of the grisly murders that occurred there previously. Tape 4 uses the wonders of Skype (Directed by Swanberg) to give us a scary tale of what appears to be a haunted apartment as a girl relays video of her surroundings to her boyfriend miles away via webcam. Now in-between the tape sequences things are occurring to our intrepid burglars and after tape 4 their story in concluded before moving on to our last tape. A group of friends looking for a friend of a friend’s Halloween party stumble into the wrong house and interrupt something they are never meant to see in our final tale of the film (Directed by Filmmaking conglomerate Radio Silence). V/H/S has a lot more working for it than not. The wraparound story from Wingard really only starts working after they enter the house as the opening destruction sequences are tedious at best. Bruckner’s tale of a night out gone wrong is very effective with a couple of good lead performances. 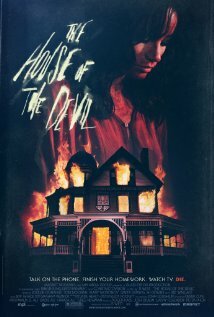 Ti West is a very talented filmmaker known for delivering intricately drawn out tales with killer finishing sequences, a process that does not transfer well to this short as it plays as all exposition without a very strong ending. Glenn McQuaid’s concept is actually quite intriguing but the execution is lacking in this nauseating example of overusing the shakiness factor of the camera that has plagued found footage films for ever since the Blair Witch Project (if my hammered friends can shoot straighter video at a New Year’s Eve party then you’re overdoing it). Swanberg’s Skype inspired little gem is quite effectively creepy and plays out to a confusing yet satisfying end. The clear cut best sequence of the film belongs to its closer from Radio Silence, a group I know really nothing about, as their take on the classic house of horrors is excellently paced and the special effects look brilliant. A scary premise that carries a wicked sense of comic timing and decent performances. 10/31/98, as it is titled, really emerges as the star of the show. Ultimately V/H/S as a whole is a solid film, spectacular in parts only, that should eventually take its place as one of the better anthologies in recent years. V/H/S is a definite recommend. Standing in line last night at Midnight Madness was a true test of willpower. I was waiting to see You’re Next, the new film from the guys that brought us A Horrible Way to Die, and I was scared out of my mind. I think at some level we are all afraid of the subjects of horror films; zombies, madmen, werewolves, etc., that’s why we watch, to be scared. However, we also have our idiosyncratic fears that will be shared by some, but the suffocating terror that seems to sink into our very bones will be not be experienced by the majority of viewers. My ‘special’ fear just happens to be masked assailants and motiveless killers. How quaint that You’re Next stars men in animal masks wielding crossbows, machetes and axes, who show up uninvited at a family reunion. It also didn’t help that an ingenious graffiti ad campaign had ‘masked killer’ art by eerily quiet parking lots and on lonely cement walls. Unfortunately for me, Ryerson theatre was not handing out complimentary blindfolds and ear plugs. As I’ve alluded to, the film is about a well-off family getting together at an elegant country mansion for a family reunion. Scream queen Barbara Crampton (Re-animator and From Beyond) and Rob Moran play the upper class mother and father, while the four privileged adult children and their romantic partners include, AJ Bowen, Sharni Vinson, Ti West and Joe Swanberg, amongst others. Once everyone arrives at the country home, the members of the disharmonious family begin to squabble, bringing up arguments and feelings from the past for all of the guests to witness. Without warning things change from bad to worse, as the family find themselves under siege by crossbow bolts from outside and machete wielding manics from inside. They have been targeted by a group of killers and cannot understand why. Can the malfunctioning family band together and stop the killers, or will this secluded country mansion be their final resting place? You’re Next has a lot going for it and is destined to become a commercial success, a cult classic, or both, it will probably come down to marketing. Every aspect of the film has many positive points. 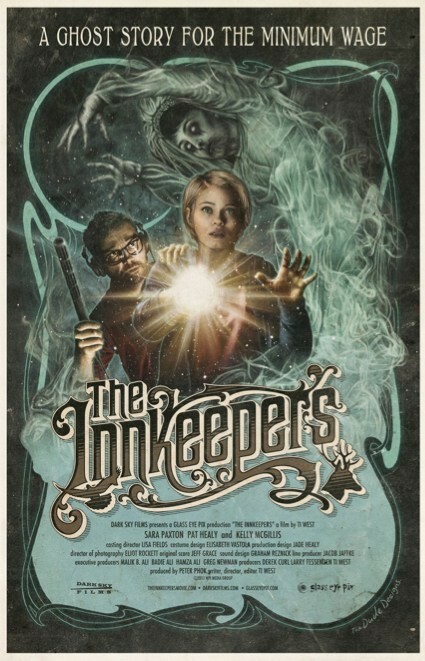 The cast is as stellar as it gets for horror movies, with the iconic Barbara Crampton, the always weird and entertaining AJ Bowen, Rob Moran, and directors Ti West (The House of the Devil) and Joe Swanberg (Nights and Weekends). However, the most exciting member of the cast is the talented and beautiful Sharni Vinson, who has cemented her place in the annals of horror cinema with the role of Erin. The combination of Barrett’s writing and Vinson’s portrayal of Erin has created what will be one of the most celebrated heroines in horror film. I’m not going to spoil why Erin is such a lovable character, you’ll just have to find out for yourself. You’re Next starts off as an extremely tense film, as the audience knows to expect a home invasion, but doesn’t know when to expect it. Wingard and Barrett set up the horror quite nicely as we are given plenty of suspenseful moments and genuine scares before the true horror begins. Also, Barrett delivers an excellent script that is very much tongue-and-cheek and pokes fun at many of the cliched lines and situations that appear in generic horror films. At some point, You’re Next takes one step back from terror and at some level becomes a horror comedy. The transition works very well. That being said, there are still genuine scares throughout the entire film, it just gives the audience a break from watching the screen with the corner of their eyes, between open fingers. The artistic palette of the film is really something to behold. I’m not sure if it was all intentional, but the colour of the furniture and wood in the mansion, the dark red hue of the blood and even the colour of Vinson’s hair look stunning together. Just look at the photo at the beginning of this review to see what I mean. The score complements the film nicely and even contains an electronic song that reminded me of Argento’s Tenebre (Goblin). Weird, but it works. In the end, You’re Next is a taut, scary thriller that seamlessly transitions into a comedic, action packed bloodbath. I urge you too see You’re Next when you get a chance. Grab some friends and see it in a theatre, it will be a blast. Wingard and Barrett hinted that their next project would be more action oriented, but if it’s not horror-themed then I’ve got news for them. Note: It’s nice to see such impeccable grammar from madmen writing on the walls with blood.